There is a place online where you are always welcome. A place that invites you to pull up a chair and kick off your shoes. A place where you can make friendships and forge bonds. A place that cares. 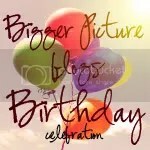 And that place, Bigger Picture Blogs, is celebrating its first birthday! I first became involved in Bigger Picture Blogs last October, when the wonderful women who joined together to form Bigger Picture Blogs were raising breast cancer awareness through a blog carnival named Write Pink: From the Head, Heart and Feet. Since then, I have participated in their Thursday link-up about Simple Moments, Bigger Picture. It has been a joy to belong to this community of bloggers. Won’t you join us? Hop on over to Bigger Picture Blogs, and read what we’re all about. Join us on Thursdays to celebrate the simple moments of life. We’d love to have you. As a part of the birthday celebration over at Bigger Picture Blogs, here is a re-posting of my favorite Bigger Picture Moment. Sometimes I start to get irritated when I hear that call…what could they possibly want at 6:25 in the morning? Can’t they at least let me drink my coffee before they start demanding breakfast? And so I start dancing along with Captain Huggy Face in the middle of the family room, much to the delight of my little girls. They know I love Captain Huggy Face. They also know which song on our Vacation Bible School CD is my favorite. “Mom, it’s the shifting sand song!” Emmy will exclaim every time track 2 starts playing. They know that I won’t eat watermelon and I don’t like chocolate shakes. Just as my daughters know my preferences, I know theirs. Lily loves watermelon, especially when I give her my portion. Emmy like cheese — lots and lots of cheese. I know what they will wear and what they will refuse to wear when it’s time to get dressed in the morning. When I am shopping for their birthday gifts, I know what toys they would love to receive. What about Ed? My husband hides his dislike for cucumbers. He doesn’t want the girls to stop eating them if Daddy won’t eat them. When the girls don’t wake up early enough to say goodbye to him in the morning, he writes them each a small note and puts it at their place on the table. What small things do you notice about your loved ones? P.S. I had insomnia last night, and Captain Huggy Face’s word “drowsy” suits me quite well today! 5 Responses to Bigger Picture Blogs’ Birthday! I will have to go over and check it out. Sweet story and thanks for sharing Capt.Huggy Face, I've never seen him before. So sweet that he leaves notes for them in the morning! I love that! Next time I see you, You have to do the Capt. Huggy Face Dance for me!